Hope Magazine, a publication of Monroe Carell Jr. Children’s Hospital at Vanderbilt, highlighted My Special Aflac Duck in its Winter 2019 issue. 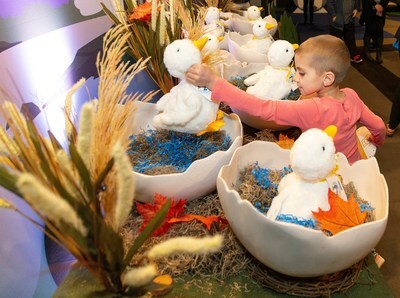 Aflac hosted a Duck Delivery Event in Nashville in 2018. The company aims to give a My Special Aflac Duck in the hands of every child ages 3-13 newly diagnosed with pediatric cancer. Five-year-old Caroline Lantz claims her very own My Special Aflac Duck, a comforting companion for children with cancer, as her prize at the end of a scavenger hunt held at Monroe Carell Jr. Childrens Hospital at Vanderbilt on Thursday, Nov. 8, 2018. Patients, families, physicians, and child life specialists at Monroe Carell Jr. Children’s Hospital at Vanderbilt are over the moon with My Special Aflac Duck. The immediate impact these “Comfort Companions” bring is undeniable. Are you ready to bring My Special Aflac Duck to your hospital? Visit https://aflacchildhoodcancer.org/MyDuck for more information.